The necessary heat to start a fire can also be generated by friction. When it gets cold we instinctively rub our hands. You will notice that the pressure applied is also important. If we rub wood timber, the temperature can be high enough for wood dust and tinder to glow. Very simple. In theory. But in practice..? Only through practice you can gain more experience and gain insight into this misery. You can ’drill’ fire. Apparently even by rolling a stick between your palms with the point pressed on softwood. Some technical improvements can help a lot. Cut a notch in the softer base board, so the drill (spindle) remains in place. You can add some fine sand and / or dust as abrasive. If you can use charcoal you can easily and quickly make a glowing ’coal’. Cut away from this hole to the side of the wood a V-shaped gutter. Along this, oxygen can reach the hole, and it’s a way to bring out your glowing material. The drilled wood powder collects here. In the V you put some tinder. Use a somewhat hollow stone (or hard wood, nutshell) as a pressure block on the upper end of the drill. The spindle must be hard, straight and about 2 cm thick. Polish the top of the drill a little to get as less friction as possible. ’Grease’ the cavity possibly with e.g. wet grass or green leaves. 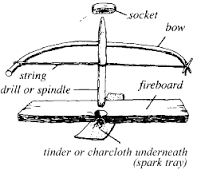 Make a bow by connecting two ends of a stick with a rope . Turn the drill shaft 1 turn in the rope so that she is on the outside (not at the bow side) (preferably). By sawing the bow back an froth the bit will turn. It takes time and practice, but it works. In the gully powder will collect. If that starts to smoke you should continue to saw until this ember glows. After this fire the tinder (by blowing). Willow and hazel are suitable for drilling. Willow, linden, poplar and maple do well as fire board. Do not use resinous species, it does not work. 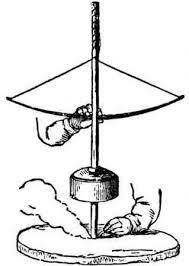 With a used fire bow the spindle fits better on the base and get faster fire. It also seems sometimes, but less easy to succeed with a fire plow, fire plough or a fire saw. The rotational movement is then an scrubbing one. Clamp some tinder between a split branch. Cut over that gap a guide groove. With a hardwood pole you saw over the groove to the tinder until it glows. Press hard enough, and especially scuff fast enough. You can also make fire by sparks of a sufficiently heavy battery and aid of some gas. Or with a lighter and firelighters. With a magnifying glass or a parabolic mirror that concentrates sunlight. But this kind of things we almost do not have close at hand. Also useful are matches. But to make such a trivial thing yourself is not easy. The cup of the current matches consists half of potassium chlorate and 5 percent sulfur. The striking surface on the side of the box contains mainly red phosphorus and 35 percent glass powder as abrasive element. But if you want to make for instance potassium chlorate yourself... that's really no house - garden and kitchen chemistry. Not so suitable to try yourself. But who thinks otherwise should make it clear to me step by step and try to explain me clearly. I'd love to. T'au Koe wrote around 950 ’Records of the Unearthly and Strange’:’.... Small sticks of pine dipping in sulfur …ready for use’. In Europe only after 1530 there has been a kind of matches.